The month of February was an interesting time at deBebians. Customers got very creative working with our custom design department and we made huge strides in the development of new products. 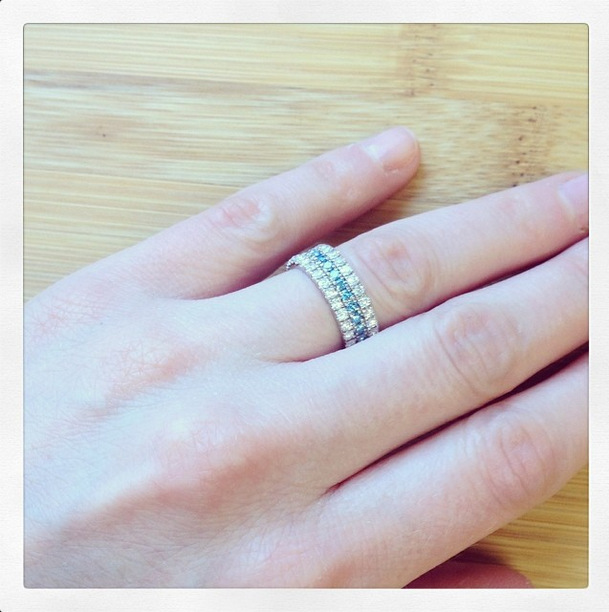 One custom ring that was particularly interesting for me was a multi-row white diamond and blue diamond pave eternity band. The custom design featured three U pave style eternity bands that were soldered together as one for a 3 row pave diamond ring. 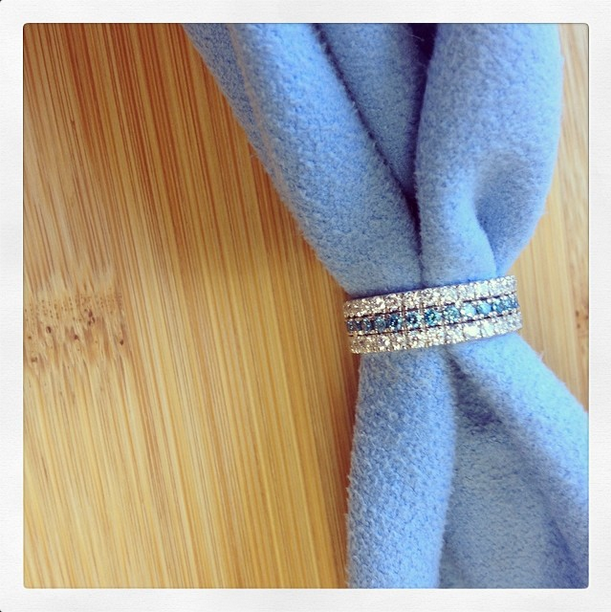 The center diamond band featured irradiated blue diamonds. Irradiation means exposure to radiation. All natural colored diamonds have been exposed to radiation deep within the earth. Irradiated diamonds are diamonds that have been exposed to further radiation after they have been mined. Irradiating diamonds simply furthers what could occur naturally in the earth if a diamond was left in the right conditions for longer. Radiation as a treatment is not limited to blue diamonds; it is used on a variety of diamond colors and also on most colored stones as well. Interesting facts about fancy green diamonds are they have a strong association with radiation. All fancy green diamonds get their color solely from radiation. Because of this, it is almost impossible to differentiate natural fancy green diamonds from irradiated ones. Only gemological Grading laboratories have the advance testing necessary to distinguish natural from irradiated fancy green diamonds. Despite gemological advances, it is still extremely difficult to prove the source of radiation. Natural fancy green diamonds are thus extremely rare and valuable. There is huge a misconception that irradiating diamonds means something foreign is done to them, when this is not the case at all. All heat treatments mimic the same processes that are naturally occurring in the earth. Non treated fancy blue diamonds are so rare and valuable that it is not economical for them to be cut into melee size diamonds. In addition, their color is not always saturated enough to give enough color at such small carat weights. Most blue diamonds seen in jewelry are irradiated, once again, this is a normal process performed on many fancy color diamonds and colored gemstones that mimics what is naturally occurring in the earth. The most essential part of this custom order for us was the disclosure of irradiated fancy blue diamonds to our customer. Educating and advising our customer on his or her purchase is why we love offering custom orders and taking on the challenge of designing whatever they want.